Download Peter and Wendy ebook. Peter Pan; or, the Boy Who Wouldn’t Grow Up or Peter and Wendy is J. M. Barrie’s most famous work, in the form of a 1904 play and a 1911 novel. Both versions tell the story of Peter Pan, a mischievous yet innocent little boy who can fly, and has many adventures on the island of Neverland that is inhabited by mermaids, fairies, Native Americans and pirates. Peter has many stories involving Wendy Darling and her two brothers, his fairy Tinker Bell, the Lost Boys, and the pirate Captain Hook. The play and novel were inspired by Barrie’s friendship with the Llewelyn Davies family. Barrie continued to revise the play for years after its debut until publication of the play script in 1928. The play debuted in London on 27 December 1904 with Nina Boucicault, daughter of playwright Dion Boucicault, in the title role. A Broadway production was mounted in 1905 starring Maude Adams. It was later revived with such actresses as Marilyn Miller and Eva Le Gallienne. The play has since been adapted as a pantomime, stage musical, a television special, and several films, including a 1924 silent film, Disney’s 1953 animated full-length feature film, and a 2003 live action production. The play is now rarely performed in its original form on stage in the United Kingdom, whereas pantomime adaptations are frequently staged around Christmas. In the U.S., the original version has also been supplanted in popularity by the 1954 musical version, which became popular on television. The novel was first published in 1911 by Hodder & Stoughton in the United Kingdom and Charles Scribner’s Sons in the United States. The original book contains a frontispiece and 11 half-tone plates by artist F. D. Bedford (whose illustrations are still under copyright in the EU). 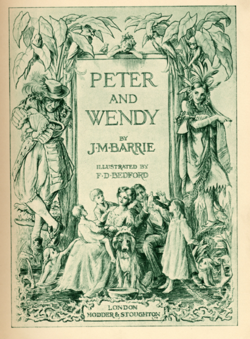 The novel was first abridged by May Byron in 1915, with Barrie’s permission, and published under the title Peter Pan and Wendy, the first time this form was used. This version was later illustrated by Mabel Lucie Attwell in 1921. In 1929, Barrie gave the copyright of the Peter Pan works to Great Ormond Street Hospital, a children’s hospital in London. I just finished reading this book to my kindergartner and 3rd grader. They both loved it, especially my 3rd grade son. They were confused at first by the differences between the Disney version and this one, and by the illustrations that are so different from Disney. But what a great way for them to learn that the characters don’t need to look like Disney OR the book, it’s all about their own imaginations! My kids marveled at how different the book was from the movie (i.e., how evil and self-centered Peter was) and they loved the ending which was not presented in the movie. The adventures were great and kept them wanting more. Many nights we stayed up past bedtime to read “just one more” page. This book should be part of every child’s collection, we adored it! Sir James Matthew Barrie, 1st Baronet, OM (/ˈbæri/; 9 May 1860 – 19 June 1937) was a Scottish novelist and playwright, best remembered today as the creator of Peter Pan. He was born and educated in Scotland but moved to London, where he wrote a number of successful novels and plays. There he met the Llewelyn Davies boys, who inspired him to write about a baby boy who has magical adventures in Kensington Gardens (included in The Little White Bird), then to write Peter Pan, or The Boy Who Wouldn’t Grow Up, a “fairy play” about an ageless boy and an ordinary girl named Wendy who have adventures in the fantasy setting of Neverland.